Ilha's marriage to the crown prince of the newly-formed Eight Banner Nation gives her people strength against their enemies, the Chakhar Gols, a warring sister-tribe. Yet when the Chakhar leader dies at her hand, Ilha finds not peace but further turmoil, and she must ask herself how far she is willing to go to attain peace for herself, her family, and her peoples. For the Eight Banner Nation has enemies of its own: an Empire with gunpowder and necromancers at their disposal. 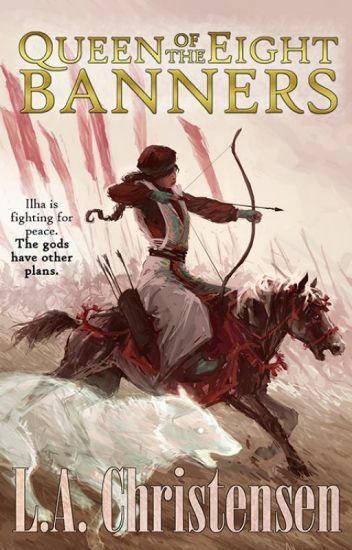 And just when her husband's victory seems assured, the gods have another fate in mind for Ilha, Queen of the Eight Banners. A new adult, history-inspired literary fantasy with fox and dog spirits, political maneuverings and action sequences aplenty. The birth of a new star and a new goddess thrusts seven exceptional people's lives into turmoil, forcing them to become fugitives, warriors, spies, and saviors. Junari, a courageous priestess with newfound faith, becomes a reluctant prophet leading a pilgrimage of believers toward the Forbidden Realm. Sao-Tauna, a brave and gifted six-year-old Tanshen princess, her resourceful tutor, Lee-Nin, and their protector Sha-Kutan, a man with unearthly powers and a mysterious past, are hunted by palace soldiers who believe the girl is a threat to the realm and must put to death. Tin-Tsu, a prince turned priest, unwillingly assumes the throne of the Daeshen Dominion as unseen enemies within the palace attempt to end his nascent rule by ending his life. Kellatra, a powerful seer with a secret past, flees her home with her family and an indecipherable lost book, hoping to escape the magical creatures who will kill her and her loved ones to possess it. Sketkee, a brilliant reptilian philosopher from the Sun Realm, races to recover a stolen ancient artifact that may reveal crucial knowledge about the urris ― the elusive magical creatures who have proscribed access to the Forbidden Realm for thousands of years. Leotin, the world-weary leader of a traveling carnival, enlists the protection of a trio of non-human outlanders from other realms as he fights to keep his people alive while trapped in a castle under siege. And Ondromead, a man who cannot die, awakens each morning in a new place to behold events he cannot fathom, such as a young boy named Hashel, whose traumas leave him speechless, but who sings songs not heard for a thousand years. With their lives irrevocably intertwined and altered, they all ask the same question: Will the goddess truly appear, and will she shatter the world as the dreams foretell? Traveling across Fellera is cold, but at least the ale is pretty good. It's even better if you have friends to share it with, and Noah's got a few of those. Though to be fair, they're probably only with him because of the magic enhancing artifact he's been tasked with retrieving. Kitera's a double agent who sometimes doesn't seem to know herself whose side she's really on. Jaden's an illegitimate prince, stuck doing the queen's bidding because she imprisoned his lover as leverage. And Noah hasn't exactly been honest about the true nature of the demon he shares his soul with. In spite of all the secrets, polite conversations turn into silly banter, strengthening a comfortable camaraderie between the three. The trouble with that is, when the betrayal comes, it hurts a lot more when it's done by a friend. You are now reading Books I and II in a combined format. They are presented here as a single volume. Book I is about a thirteen year old boy's journey into magical healing. It is a time of awakening. Awakening to who you are, what you are meant to be, of friends and young love, of power and its use for good or evil. Book I is the book of beginnings. Book II outlines the further adventures of Julian, Nicole and Brian after they have grown up. What's at stake is magnified exponentially as the extent and full power of the Tree becomes realized. So, thank you all so much, but please do not edit my work for spelling or grammar. All right? :-) I'd rather get there on my own, eventually. [featured + long-listed] "The eyes begin to see clearer in the darkest times." The Martial Empire had been built to withstand an onslaught of human kind. With brutality in their blood and name, they were considered as humanity's most lethal enemy. They were called the Gifted. When Gin learned that the monsters that lived on the other side of the wall exist, she knew that her peaceful days in the city of Ksenia was at stake. With her life on the line, she had to keep herself away from the nature that was in her instincts and gifts from her fingertips intact. Upon the dark chasing after her, wanting her back, Gin had to carry a secret within her. A secret that will cost her life. After all, freedom was never free from the start. **Featured on Wattpad's Eastern Fantasy 19/6/18 and Wattpad Picks 20/7/18** Lian snuck out of the imperial palace and exposed the village healer to be a fraud and a devil-worshipper. Cursed by the spurned fire god, Huogwai, and disgraced and cast out by the royal family, Lian set out with her manservant Emiru to the kingdom of fire to rid her of the curse of uncontrollable flames for a chance to regain her claim to the throne. But being a fire disciple meant she was a practitioner of the forbidden arts. For those that hunt her kind, the game had just started. Formerly Firestarter, part of the Open Novella contest. When a near-death experience convinces Ran that it is his destiny to be savior of his planet, he's determined to get the other warlords to fall in line. Just as he starts to get the fractious warlords under control, the General Union Space Corp comes calling. It's uncertain what they want from this forgotten colonial planet on the edge of colonized space. With a galactic-sized threat hanging over his head, Ran is going to need all the help he can get to keep Dobruja safe from enemies foreign and domestic. "You know, this is who we are. This is who you are." he would end the night with. "Somethin' out there-" he would point among the lights of constellation. "put us here for a reason. We got to find that reason." After introverted, seventeen year old Caleb Tucker moves into the family inherited home in a Northern Michigan town called Avelak with his older sister, Elsie, Caleb comes to the realization that the death of his Great Uncle Clyde has enabled him to possibly live a normal life without his 'spiritual body.' Caleb soon learns that he is not the only one in this small town with a supernatural ability; he meets the infamous, snobbish and astoundingly handsome Maximilian Finch who is a Dhampir in transition and Nora Pennington; a bullied yet bold psychic who has dreams of flickered visions of the future. When two students from their high school go missing, its up to the trio to trace the unwelcomed killer in this once tranquil town. An ancient threat, an explorer, a princess, airships and a magic sword. The Mechanical Crown is an epic adventure full of intrigue, mystery and adventure. Plus a bit of romance. Evil spirits. A cursed prince. Death itself in disarray. Iris just wants to go home, but fate has other plans for this young priestess and her odd companions. The land of Erinlin is dying, its ancient traditions choked out by the Kaerent church and its true priestesses, the Candlemaidens, increasingly regarded with fear and suspicion. All Iris wants is to tend her candles, win her shade battles, and chat with the spirits of her realm. But when she is torn away from her home by the Kaerent king, she learns that her country needs her to be far more than a typical Candlemaiden-- she must be as the legendary priestesses of old and walk through Death itself. Cover help from the awesome @ArdenBrooks. Special thanks to @rainersalt, @giveitameaning, and @piperjones033 ! Sixteen year old Sofia Aguilar believed she was doing the right thing when she relocated three thousand miles to be with her dying mother (mãe). Now her home is a remote, isolated village buried deep in the Amazon where nobody speaks English and where the weather is unbearable. To make things worse, Sofi's mãe is too sick to remember her own daughter. Bored and depressed, Sofi desperately searches for something to take her mind off her situation. It isn't long before her aunt warns her of an ancient superstition that has dominated the Amazonians' imaginations for thousands of years. The locals call it the legend of the Encantados - river dolphins that transform into mystifyingly attractive young men and women. Encantados can control the weather, bend humans to their will, and even invade dreams. Instead of avoiding these enchanted monsters, Sofi seeks one out named Amancio, and strikes a deal with him. She will help him uncover his memories if he can find a cure for her mother. At first Amancio seems sincere in their bargain, but Sofi will soon learn that these shapeshifters are not at all what they seem. And so the Encante Trilogy begins . . .